Is Enhanced Active FX Painful? glowing skin that’s constantly on the cover of your favorite magazines. We want to be able to walk out of the house without worrying about how our skin looks to our friends and neighbors. We want to feel confident in our skin, without the help of makeup and other types of concealers. Does the above sound familiar to you? 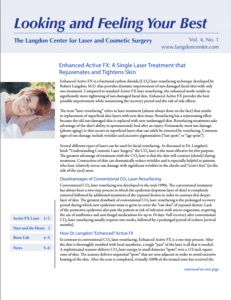 Then it’s time to discover Enhanced Active FX laser resurfacing, now available at The Langdon Center for Laser & Cosmetic Surgery in Guilford, CT. This innovative treatment — developed by founder and board-certified cosmetic surgeon Dr. Robert Langdon — combines the best of skin resurfacing with youth-enhancing skin tightening. The end result is skin that looks completely rejuvenated and ready for its close-up! Enhanced Active FX is the best solution for hyper-pigmentation (sun spots or age spots), wrinkles, and loose skin caused by sun damage or the aging process. 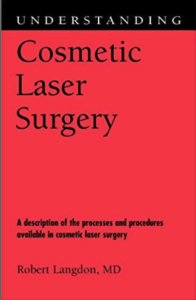 This special laser treatment employs CO2 laser energy to precisely heat superficial skin layers. Within a few days the entire epidermis (superficial skin layer) gently peels off, revealing smoother and more perfect skin. Also, there is typically no pain during the treatment because Dr. Langdon provides complete anesthesia. Although a standard Active FX treatment ends there, the Enhanced Active FX treatment goes a step further by tightening and toning the skin. The CO2 laser heats the skin enough to trigger immediate skin tightening and long-term collagen production. The Enhanced Active FX treatment is designed to achieve better results in a shorter time period, which is the perfect option for people with busy schedules. Patients can expect five to seven days of downtime during which they need only apply a facial moisturizer. To learn more about this exciting new procedure for age spots and skin tightening, schedule a consultation with board certified cosmetic surgeon Robert Langdon, MD at The Langdon Center for Laser & Cosmetic Surgery in Guilford, CT today!